June kicks off a summer of Chicago dance with neighborhood festivals, company seasons and single events, with dance styles ranging from contemporary to jazz and tap, multi-disciplinary to culturally specific, musical theater to hip-hop. Check out our highlights, and try something new in June! The Summer Series kicks off a full year in celebration of the company’s 40th anniversary. It combines audience favorites representing all four decades of Hubbard Street’s history, including Founding Artistic Director Lou Conte’s full-company The 40s, Hubbard Street’s longtime signature work; Conte’s beloved duet Georgia, originally premiered in 1987 as part of the triptych “Rose from the Blues”; Twyla Tharp’s The Golden Section, premiered on Broadway in 1981, and debuted by Hubbard Street in the Netherlands in 1991; the full-company work One Flat Thing, reproduced by William Forsythe and solo A Picture of You Falling by Crystal Pite; and excerpts including scenes from Palladio (2007) by former Hubbard Street Artistic Director Jim Vincent, and One Thousand Pieces (2012), the company’s first evening-length production, created by Resident Choreographer Alejandro Cerrudo in response to Marc Chagall’s America Windows at the Art Institute of Chicago. 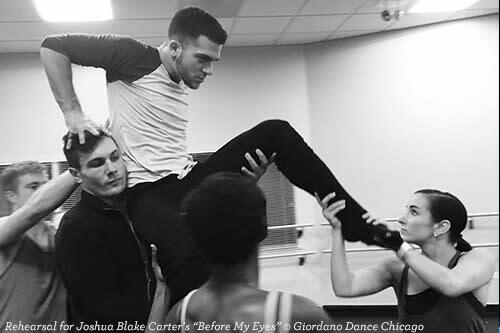 Giordano Dance Chicago closes out the Auditorium Theatre’s “Made in Chicago” Dance Series honoring dancer Joshua Blake Carter in his final stage performance before assuming a new, non-dancing role with the company. The program presents a range of emotions, musical genres and dance styles in a program from its critically acclaimed repertoire: Lost in This World, a work from “Choreographer to the Stars” Liz Imperio (Jennifer Lopez, Gloria Estefan, Madonna); Before My Eyes, the company’s 160th world premiere piece choreographed by Giordano dancer Joshua Blake Carter; Grusin Suite by Frank Chaves (River North Dance Chicago); Roni Koresh’s EXit4; Jon Lehrer’s A Ritual Dynamic; and Autumn Eckman’s commonthread (performed to live music played by violinist Dan Myers). Now in its landmark 54th season, this iconic company creates passionate, celebratory, and high-energy choreography, often redefining and expanding the very definition of American jazz dance. The performance is part of seechicagodance’s Dance Around Town Sampler Pack. Featuring work in progress by renowned choreographer Sherry Zunker as she makes art with CRDT again this year. Go Inside the company, experience works in progress performed by the company’s Dance & Music Ensembles, chat with Sherry and her collaborators about how and why they&apos;ve created these pieces and what they plan to do next AND help in shaping these works before they premiere at CRDT&apos;s 2017 Fall Concert Series (October 5–7 at Links Hall). CHICAGO TAP THEATRE is excited to re-imagine one of their most acclaimed story shows. Acclaimed director Harrison McEldowney and choreographer Mark Yonally present this science fiction tale of a planet inhabited by peaceful aliens and the events that unfold when they encounter both a power-hungry species from another world and a potential hero. Audiences will enjoy hearing their favorite Bowie songs with new elements, weaving the original haunting and unforgettable vocals with live instruments and remixed scores by Kurt Schweitz. This is CTT’s follow-up to the award-winning TimeSteps, picked as the Best New Production of 2016 by Dance Magazine. A celebration of innovative performances in theater, dance, music, puppetry, site-specific works, celebrations and a parade!. The 2017 Line-Up includes: Rough House Theater, Ayako Kato/Art Union Humanscape, Synapse Arts, The Neo-Futurists, Barrel of Monkeys, Same Planet Performance Project, Axis Lab, Storytown Improv & many more! See individual listings for details. Premiering new projects developed by Co-Mission Resident Artists. Dynamite by Jenn (Po&apos;Chop) Freeman (June 1 & 2) explores memory and masculinity. Genuine Fake by Joanna Furnans (June 3 & 4) delves into the tendency to conform or defer to the will of the mass. The Original Showgirl by Darling Shear airs June 2 & 4, and All That I Remember by Jessica Ray will be performed June 2 & 3. An evening devoted to complex and intersecting narratives connected to identity. Themes of resistance, community, power and fortitude, womanhood, and the right to self-determination are given narrative in five complementary works infused with Red Clay’s signature Afro-contemporary style. The Spring Concert features two world premieres, The Art of Resilience and Blackbird, alongside repertory favorites, Diamond in the RUF, Body of Evidence, and DevelopMino. Join Red Clay after the concert for the annual Paint the Town Red after-party. 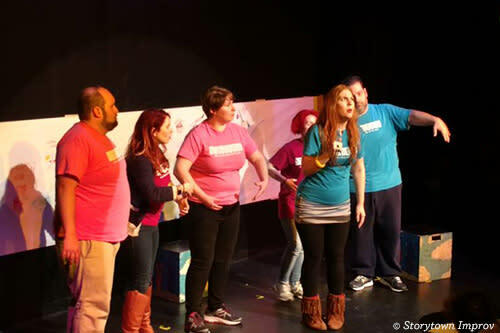 A Pivot Arts Festival show of live-readings, that subjects written essays to spontaneous interruptions, complications, absurdity and horseplay. Created by Neo-Futurists Kurt Chiang and Lily Mooney, "The Arrow" is different for every performance. THE PEOPLE’S REVOLUTION OF 2017, Curated by Tiff Beatty (7:30 p.m., June 8, Uptown Underground) Presented by the Pivot Arts Festival, is a multi-disciplinary, hip-hop-based interactive performance and conversation series. In addition to her dynamic spoken word performance, Tiff curates, hosts and facilitates a space for performers and their creative audiences to co-create freedom and equality for all. As part of the Pivot Arts Festival, presents a special cabaret-style performance of some of their favorite musical adaptations—complete with wigs, props, and hilarity straight from the minds of children. Barrel of Monkeys teaches creative writing in Chicago public elementary schools, and adapts stories written by their students into fully produced songs and sketches. Unlike their more family-friendly shows, this one&apos;s for the grownups - and adult beverages will be available for purchase! The 5th annual tradition of ice cream (well, custard . . .) and improv! Join Storytown at Lickity Split for an all-ages show that includes live music, improv and sweets for purchase. Features three world premieres: two by Co-Artistic Directors Brenna Pierson-Tucker and Christopher Tucker and a third by EDP’s second recipient of its Choreographer Mentoring Program, Kelleigh Harman McIntosh. This weekend-long series explores the concept of perspective in its many characteristics: A Superfluity of Movement delves comically into space awareness and its relationship to movement and environment, Infinite Silhouettes investigates the unnoticed lines created by a dancer’s movement with the enhancement of fabric, Momentum of Being explores the various standpoints on the impetus of day-to-day life. A one-hour event designed to offer opportunities for choreographers to show their work informally, create a forum for dialogue among artists, and build audience for dance. Inspired by the concept of open-mic night, DanceChance is held once a month and features 3 choreographers chosen by chance, each of whom has a 15-minute time slot to share their work. To round out the hour, the final 15-minute segment is a moderated meet-the-artist session providing an opportunity for choreographers to discuss their work and process as well as time for the audience to ask questions. At the end of each DanceChance, the next trio of participants is chosen from names submitted by choreographers in attendance. This feature is brought to you by SeeChicagoDance.com, the definitive guide to Chicago&apos;s dance scene and your source for a full calendar of performances in the city. Read about all the dance highlights in the month of June at SeeChicagoDance.com.